In a rare move, Rep. Tulsi Gabbard rebuked Democrats–including a fellow Hawaii Democrat, Sen. Mazie Hirono–for questioning a judicial nominee about his membership in Catholic organizations. Nebraska attorney and former attorney general candidate Brian Buescher was nominated by President Donald Trump to serve on the state's U.S. District Court. In written questions, Hirono questioned the Catholic lawyer about his membership in the Knights of Columbus, a Catholic fraternal organization with over two million members that upholds Church teachings on social issues. "I do not recall if I was aware whether the Knights of Columbus had taken a position on the abortion issue when I joined at the age of eighteen," Buescher answered at one point. Conservatives balked at the line of questioning, claiming it violated the constitutional guarantee that public officials not be subject to a religious test. 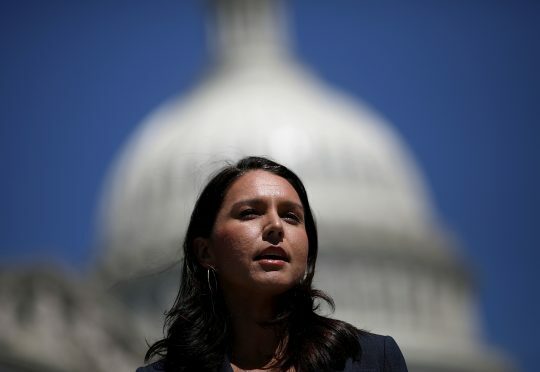 In an op-ed for the Hill, Gabbard agreed, arguing "Elected leaders who weaponize religion are playing a dangerous game." "While I oppose the nomination of Brian Buescher to the U.S. District Court in Nebraska, I stand strongly against those who are fomenting religious bigotry, citing as disqualifiers Buescher’s Catholicism and his affiliation with the Knights of Columbus," she wrote. "If Buescher is ‘unqualified' because of his Catholicism and affiliation with the Knights of Columbus, then President John F. Kennedy, and the ‘liberal lion of the Senate' Ted Kennedy would have been unqualified' for the same reasons," she argued. While Gabbard is Hindu, her father Mike Gabbard is Catholic. He is a member of the Knights of Columbus and received the organization's Lifetime Achievement Award in 2006. Gabbard never called out Hirono by name, but a spokesperson for the senator hit back in a statement, saying Hirono "asked Mr. Buescher, who has a clear record of anti-choice activism, whether he could separate his personal beliefs from decisions he would make if confirmed for a lifetime appointment on the federal bench." "It is unfortunate that Congresswoman Gabbard based her misguided opinion on the far-right wing manipulation of these straightforward questions," Hirono's spokesperson said. This entry was posted in Politics and tagged Democrats, Hawaii, Mazie Hirono, Tulsi Gabbard. Bookmark the permalink.